Sad to watch this unfold, but Steven Furtick's brother Matt Furtick has gone on the offensive to defend his brother, using his Twitter account to make terrible accusations against WCNC reporter Stuart Watson. Here is a sampling of the many bullying Tweet's Matt Furtick has posted since Stuart Watson's expose on the finances of Steven Furtick and Elevation Church began on October 22nd. By the way, WCNC aired the fourth part of Watson's pieces, exposing some of the contents of a confidential Elevation Church financial report. Yes, attacking the manhood of Stuart Watson. How Christ-like of Brother Matt. Just a tad bit aggressive, almost threatening. 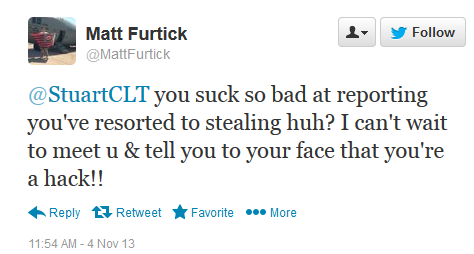 Matt, Stuart is an Emmy-award winning reporter, and I don't think your biased view of him carries much weight. Oh yes, the old "coward" accusation. I heard that so often back in 2007 and 2008 - along with "man up". Again, that is Holly's October 24th reply to Matt's October 23rd Tweet calling Stuart Watson's report a "joke", a biased piece with "no factual information". 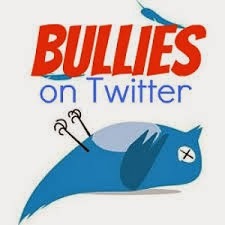 After Holly seemed to publicly endorse Matt's characterizations, he then became more aggressive on successive days in attacking Stuart Watson on Twitter. 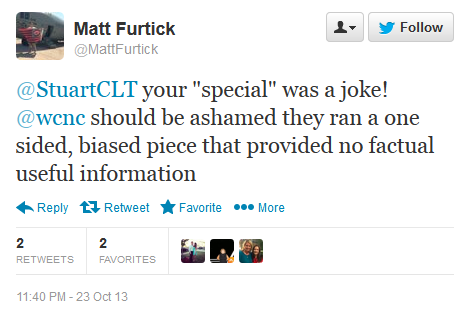 Matt Furtick describes himself as not being "affiliated" with Elevation, but says that he does attend when he is in town. Perhaps he helped Steven write the "Hey Haters" script? I certainly understand Matt wanting to defend his brother, but this is just over the top to accuse a reputable reporter like Stuart Watson of being a "hack" and a "coward" - even questioning his manhood. But this is standard fare when a person dares to ask questions about the finances of a mega church and the pastor. Stuart, thanks for showing the grace and kindness that Jesus would show to those who are attacking him. You are the Christ-like example. Not the pastor and his brother, sad to say. And Steven and Holly - you might want to reign in bro. Matt. He's really going off the deep end on some of his Tweets. Poor widdle Matty, dripping with juvenilia and foot-stamping childishness...has he not heard of the old saying that it is better to keep you mouth shut and be thought a fool...? Why do you think they call them "Twits"? Maybe if FBC Jax Watchdog, Wartburg Watch, Spiritual Sounding Board, et al posted a few more blog exposes, we could get Widdle Matty to thrash on the floor screaming until he's as red in the face as Perry Noble and pooping his diapers. Is Matt in the 8th grade? This exchange leads me to believe there is as little communication between Steven Furtick and his brother, Matt as there is between Steven Furtick and the attendees of Elevation Church. Steven should have shut this down long before it got so out of hand. Matt isn't defending Steven, he's actually showing all of us how he operates. The vitriol of these Twitter attacks reminds me of a certain Ergun Caner defender back in 2009 and 2010 who was so threatening I had to call his local police department. So for nearly two weeks THE F's have let their actual blood brother (NOTE - NOT a fringe element wacko!!!) spout of in an aggressive, mean and demeaning manner toward a reporter who did a piece he disagrees with without EVER publicly saying a word to govern/admonish/ teach/ chastise/anything? What is Steve really...just a blooming speechless fool? Then worse little Holly (at arms length to have deniability "...oh gosh golly what a sweet innocent bro you are..." ) encourages it to continue? I seem to remember an old addage "...more is caught than taught..." . Elevation Church members are you paying attention? Wow! 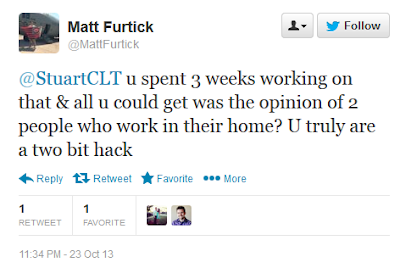 So what's the difference between Matt Furtick and a puppy? Sooner or later a puppy will grow up and stop whining! LOL!! I'm sure Stuart Watson will have to enter therapy to deal with the pain. Right after everyone down at the news station gets up from ROFL. "Out of the abundance of the heart, the mouth speaks." I'd get out of that church as fast as my legs could carry me. Of course his family defends him because they are all alike. Hypercapitalism is destroying the churches in America and keeps setting up this problem. Its time to leave the dilecticism behind and follow God's true intentions. It is appalling that Furtick hasn't called out his brother for such tweets - is there no shame among the mega-churched and their pastors? Instead, it appears that Mrs. Furtick is pleased with the shameful tweets, rather than the Furticks reining in the brother and apologizing. Where are the church members? I am a pastor's wife, and I can't imagine our church reacting passively if one of our family members displayed such ungodly speech publicly in Twitter posts defending us, not to mention how embarassed my pastor husband and I would be. It is unconscionable that this lack of Christian character displayed seems to be common among some pastors, leadership and their "followers". How can this honor the name of Christ and promote the Gospel to the perishing? I am thankful for sites such as FBC Jax Watchdog who keep us informed. "It is unconscionable that this lack of Christian character displayed seems to be common among some pastors, leadership and their "followers." This is why I would not call them Christians. They are wolves. The wolves will always have their minions and followers. Why even draw attention to what are obviously the ignorant rantings of an emotionally immature young adult? And please don't be so foolish as to actually engage this kid in a playground scuffle. Not to defend this kid, but I'm not so sure but that at that age I had the maturity and reasoning ability to come across as anything other than an overgrown baby. What a bunch of idiots. I have never see so many stupid people on one blog. Stop being so angry.and jealous and realize that this church and pastor are creatively introducing Christianity to a group of people who, otherwise, might have never knew it. Sounds like anonymous above my post attends the Furtick's church or is directly related to them. That's the only reasonable explanation as to why they would defend the immature and unChristian behavior of Matt Furtick. What, prey tell, are we jealous of and why should we not be angry when someone who is directly related to a mega church pastor acts in such an antisocial and out of control way? Are we as Christians supposed to be tolerant of blatant sins in the church and not call it out, as directed by Paul in the Bible? Most importantly, Steven Furtick's "Christianity" is foreign to what we're told it is in the Bible. So, he's indoctrinating a generation to the "religion of Furtick" and not Jesus Christ, the only one who can save. 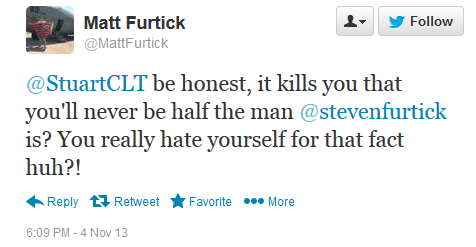 I do not go to Elevation Church nor am I associated with the Furtick's in anyway. I have not been to Elevation nor do I plan to ever visit their church, but whether he is or is not the man of God he claims to be and whether or not this church is acting in a Christ like manner all of this is a huge distraction to what we as Christians are suppose to be about and the mission we are to be carrying out. The person who commented "you might want to reign in your brother" needs to go back to school- rein is spelled rein not reign. I love Steven Furtick's messages and books. With that said, it's really troubling to see the depths of his own personal greed. I don't know of any pastors who would feel comfortable about building an unnecessarily extravagant $1.7 million dollar home while the rest of the world is suffering. Very, very poor example and causes me to question his entire leadership capabilities. I did not enjoy the environment.. But while there several people stood up in that they ask the Lord Jesus to forgive their sins and for Him to come into their lives...so as Jesus said if their not against me they're for me....we'll all stand in judgment one day...whether this man ministry is or is not what he say will be known. I haven't checked lately, but it used to be in our Sunday bulletin at Prestonwood Baptist Church, Plano, TX that if the music was too loud, the usher would provide ear plugs. I am NOT kidding! Being an award winning in my investigating a few comments to share: Elevation Church has given over 10 million to Outreach programs, Can you name 1 other church in NC that can match that? Elevation Church has millions of hours of volunteers to Outreach programs, again, Any other church in NC, anyone? hmm, silence In researching I witness Pastor Steven Furtick literally preaching from scriptures, Yes in a new age way to reach and raise up new christians in this world. For that I am grateful. Far too many churches in NC are not raising a generation of christians in Fact, Should we expose the large churches which have youth ministry that have inappropriate behavior and are harming our teens? Should we look at the Finanacial comparisons of each church in NC and the numbers that each has donated to outreach programs? Peanuts in comparison to what Elevation has accomplished in raising and GIVING in a christian manner. I am grateful to see that we have a Pastor who is Brave enough to build a true church, House of God and anointingly preach from scriptures to a group of young and old to become christians to give not only monetarily but of themselves to outreach programs. What an inspiration. IN regards to Stuart Watson, well having 14 years exp. in media, at this point he is crossing into risky legal boundaries at this point. It appears that when Stuart could not succeed at one angle to land an interview then he continues to harrass and attack from different angles. SMH, not going to work and could possibly end up costing WCNC massive amounts of money and perhaps a license. Surely, the Gannett Corp. will step in at some point and pull the rug if this property makes enough cash for the Corporation. 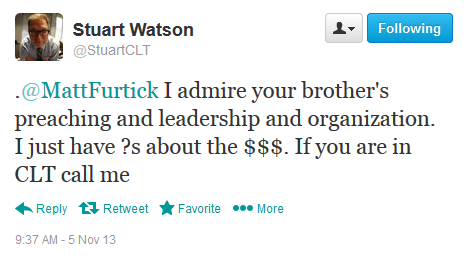 I do feel that Stuart Watson himself should be exposed on his Christian values and contributions. Does he attend church, how much does he give monetarily and volunteer to his church? Also, How much does his church donate to outreach programs? Let's take a look behind that curtain shall we? At some point someone with an objective view must step in and look at both sides of this equation and bring rationality into this conversation which is what I will do. All parties have a purpose, perspective and agenda. Even this Watchdog has an Agenda which includes anti mega church outlooks. So I will encourage other true good investigating to this topic and expose all parties on this page and other Blogs, Platforms, etc. It is time that true research and true reporting return to media. SMH, it has been too long as per most stations are 100 % about ratings, the real facts and reporting was pushed out when Corporations demanded the rating for money and profits. Another sad truth. we should all pay attention to the word of God rather than what the preacher does with his money,he has not robbed a bank,he peaches endlessly standing on his feet,and people want to question his finances?If he was not a young successful preacher would we be doing this?its a shame how we want a change in our lives and in the upbringing of our kids,but continue to sneak peak the wrong things in life.it's not an obligation for people to give offerings in church,Regardless Partor Steven is a man of God who attracts all ages his preaching is of modern day life style,and this is one of the few churches I know that has an extensive amount of teen agers participating in church even without their parents.It is amazing what Pastor Steven has done and is still doing in the life of our children.